As a devoted fan, I wholeheartedly agree with this sentiment. I am more than willing to wait until 2012 or 2013 for the next installment of the game series, especially knowing that it will set a new assassin in a place in history other than Medieval or Renaissance times. Part of the fun of AC is the setting. The designers do backdrops extremely well with their attention to detail-glittering waterfronts and exact replicas of Italy’s most famous building structures. The panoramic views alone stop my breath. I can’t wait to see which era they choose next. So allowing the Ubisoft team a few years to fully actualize another time period and back story for Desmond’s next ancestor can only improve the game that much more. I can understand why Brotherhood is being released only a year after Ezio sprung onto the scene-it is a continuation of his story using the same basic design with the added multiplayer aspect. 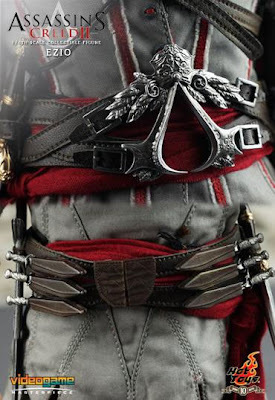 And Ezio is a brilliant lead, with all the characteristics of a renegade hero-family slain due to crooked politics, fighting corruption above the law while still managing to accessorize well (check out that belt buckle!) while scaling walls like Spiderman. Whereas Altair had ‘mystery’ (scant back story or charisma) in the first game, Ezio has personality. As a player, I instantly invested in Ezio far more than Altair, even if I didn’t necessarily have a preference one game over the other. I think of them as chapters in a book, with the future being the central string tying them all together. I am just as interested in eventually playing Desmond’s story as I am walking in his ancestor’s shoes. I hope the creative team wins this round, because I certainly love them far more than the men with the money. And as an utter AC fan girl, I would like to send them a message that I am willing to wait years for the next chapter in Desmond’s story, confident that the newest incarnation will be beautifully developed with care. "[For AC3] We know exactly where we're going," Boivin said. "It would lack vision and blunt intelligence to wing it episode after episode. We have to have some vision with the story…It's the story of Desmond Miles, and it's the story of a machine called an Animus that reads genetic memories from your ancestors. It has to stay in there." 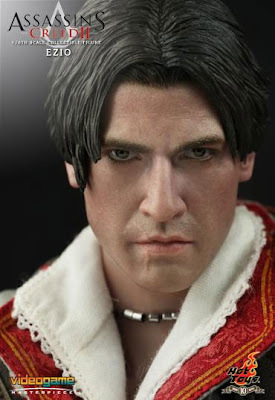 *The photos above are from a post on Kotaku displaying the latest Ezio figure by Hot Toys. Beautiful!